Boys ranches in Chattanooga Tennessee for troubled boys do not compare to Prayer Mountain Boys Ranch – troubled teen boarding schools and rehabs for teens. Prayer Mountain is a Boys Ranch located 50 miles southwest of Atlanta, Georgia, specializes in dealing with problems facing troubled boys ages 13-17. In the home-like environment of this ranch, boys from Chattanooga, Tennessee learn how to become successful, productive young men. Prayer Mountain’s gorgeous 36-acre ranch campus is located in Western Georgia. In this serene and homelike setting, boys can make lasting changes in their lives. A key component of this lasting change is relationships. We teach the boys how to form healthy relationships with themselves and their peers. This lays the foundation for them to repair other broken relationships. Positive choices are encouraged and rewarded here at Prayer Mountain. Through such positive choices, boys here advance through our three-level program. When boys arrive at the third and highest level, they will gain increased responsibilities and training for leadership roles. Leadership is our eventual goal for all the students here, and they learn that it comes with humility and obligation. The boys that join and finish the program here at Prayer Mountain receive training in leadership that they can carry with them long after their time here. As opposed to many other boys ranches in Chattanooga, Tennessee, our goal is not simply the correction of negative behaviors but also shaping young men who will be good influences on their hometown communities. Our commitment to training the future leaders of America does not stop when students complete the program here. The Emerging Leaders Program is an extended training program that shapes young leaders by granting them the skills, training, and even an on-site internship to get them ready for future opportunities. This program is an optional opportunity available to students enrolled in Prayer Mountain. In addition, there are tracks within the Emerging Leaders Program aimed at creating future staff members, training them not only in leadership but also in the tenets and history of the Teen Challenge program. Chances like this are just a part of what sets Prayer Mountain Boys Academy apart from comparable boys ranches in Chattanooga, Tennessee. Prayer Mountain receives a great deal of support from the community in the form of donations. For this reason, we can offer treatment to teens from Tennessee at much lower cost than other boys ranches in Chattanooga, Tennessee. Due to the irrefutable success demonstrated here, our community is very thankful for the work done at Prayer Mountain. Their donations allow us to offer our high quality services at a tuition much lower than comparable boys ranches in Chattanooga, Tennessee. Our mission is to maintain our high standards of care without becoming cost-prohibitive. It is clear that Prayer Mountain changes lives. As a leading low-cost boys ranch, few other programs offer the long-lasting change that is produced here. Let us help your troubled teen from Chattanooga, Tennessee as we’ve helped so many other teens across the country. Through the environment created here at Prayer Mountain, the boys who graduate this program will experience a powerful change. As well as becoming leaders and trusted members of their communities, they will experience a vital change in outlook. Avoiding responsibility will no longer be a part of them. Instead, they will be able to hold themselves accountable and take responsibility for their actions. They will be authentic and trustworthy. Joy and peace will become a part of their character through practice of the spiritual principles taught here. These are the hopes for boys who were once struggling and proof that hope is very much alive here at Prayer Mountain Boys Academy. 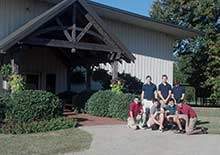 If you are searching for boys ranches in Chattanooga, Tennessee, we at Prayer Mountain Boys Academy can help you, even though our facility is located in Georgia. In many such instances, it is best for the boys to be away from home in order to best change their attitudes and behaviors. Chattanooga is the third-largest city in the US state of Tennessee (after Memphis, Nashville, with a population of 167,674 as of the 2010 census. It is the seat of Hamilton County. Located in southeastern Tennessee on Chickamauga Lake and Nickajack Lake, which are both part of the Tennessee River, Chattanooga lies approximately Convert to the northwest of Atlanta, Georgia, Convert to the southwest of Knoxville, about Convert to the southeast of Nashville, and about Convert to the northeast of Birmingham, Alabama. Chattanooga abuts the Georgia border, and the region is at the junction of three major interstate highways: I-24, I-75, and I-59. The city, which has a downtown elevation of approximately Convert, lies at the transition between the ridge-and-valley portion of the Appalachian Mountains and the Cumberland Plateau. The city is therefore surrounded by various mountains and ridges. The official nickname for Chattanooga is the Scenic City. Chattanooga is ranked 8th out of America’s 100 largest metro areas for the best “Bang For Your Buck” city, according to Forbes magazine. The study measured overall affordability, housing rates, and more. Excerpt about boys ranches in Chattanooga, Tennessee, used with permission from Wikipedia. We can also help you in your search for other special education, boarding schools, therapeutic boarding schools, residential schools, or therapeutic boarding schools. This is a Teen Challenge boys ranch and boarding school program dedicated to helping troubled boys get a new start in life. Our boys ranch is a therapeutic program that offers hope and an opportunity for a new and more productive future for at-risk boys. Teen Challenge therapeutic boarding school and ranch providing behavioral therapy for troubled teenage boys.